“War clouds gather as nations demand a piece of the Nile” is how the UK based Times-online has titled a recent article on the Nile issue. For several generations now, Egypt has been engaged on saber rattling and using various tactics to bully and control the waters of the Nile. It has been waving an old and moth bitten rag of a Colonial treaty paper giving it veto power on the River by Great Britain. The fact of the matter is that the Nile River, 85% of which come from Ethiopia, never belonged to Britain, and therefore, Britain had no right to give it away in the first place. Several times in 1875 and 1876 during Emperor Yohannes’ reign, Egypt invaded Ethiopia and tried to occupy if possible all, if not, at least the Nile basin area, but failed. The greatest defeat came when Kedive Ismael1 sent an Egyptian army with his own son heading a detachment that was totally annihilated by the Ethiopian army, marking the end of the then Egyptian Empire. Even before that, the eleventh century kings of Ethiopia collected tribute from Egypt for the waters of the Nile. “…A century later, King Lalibela actually made a move to deflect the course of several tributaries, but monks warned him… and he abandoned the project.” 3 And yes, that was the other intrigue exploited by Egypt to the hilt - religion! It was the tradition for Egypt to send us a Patriarch for The Ethiopian Orthodox Church, all were but wolves in sheep’s clothing, spies on a mission to keep the River Nile flowing, by making threats and spiritual curses at the king and his administration. Those tricks can work no more as the Ethiopian Orthodox Church has long been freed from all her spiritual fetters of the Egyptian Church in Alexandria. So, if Egypt does not change its attitude but continues to threaten us with war, let it be known that Ethiopians do not fear war. We welcome it! And if Egypt should fire the first shot, we may not even need to fire back. Our waters will do all the fighting for us. In these days where many nations would pay to get rid of their nuclear waste, it would not take more than a few dozen of highly active rods thrown into the Aswan dam and all along the 4000 mile stretch of the Nile to turn Egypt into a desert wasteland for the next five hundred to a thousand, or even more, years. 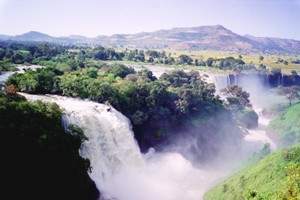 If any country should have a veto power over the Nile, it is not Egypt that does not contribute a single drop of water into it, but Ethiopia from where comes 85% of the waters and a 100% of the soil it carries to fertilize and enrich the farms of Egypt and Sudan. So, Egypt and Sudan are well advised to fall down on their knees, beg for mercy, and make quick reparations for the centuries of abuse, saber rattling, bullying, threats, and attacks they directed at their benefactor, Ethiopia.